Nice report, Tom. Glad you could make it and that you enjoyed the ride. Thanks for the pics, too. Always fun to see the route/event through different eyes. Hope to see you at other enduro stuff in the future! Cool that you hit Sweetwater, too. I thought about emailing you to offer to show you a ride, but I decided to take two days off given my aching knees. Next time? i think you got me mixed up with someone else. Rob caught me on Freeman rd. and we road most of the way back together and finished the same time. but it's all good. Sick Tom! Nice work...You are my hero for gettin' to ride all that cool shiznit! Veeze, yep, I was mistaken. That rider was actually Andy Stevenson. I updated the post to reflect that. 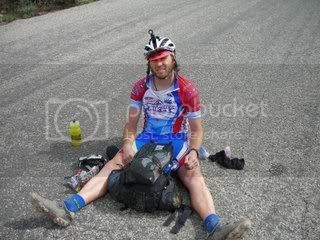 I think you must have been one of the guys (along with Lee and Chad) who was at the lot when I finished. Thanks for coming out for the APC. Hope to see you this summer!